…..news letter #521 – ick…..
in what is becoming the ups standard, we’re still waiting on a box here, but i guess they still have a bit of time. not that there’s a huge amount in that box. next week there should be a lot more in this little list, as i know of a few things that are en route. anyway there’s still lots to catch up on anyway, right? – super cool early 80s japanese synth explorations. 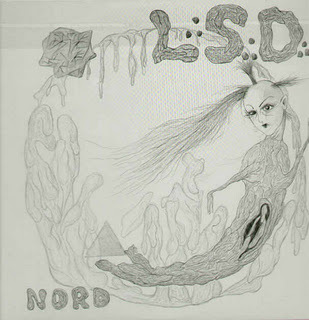 “the first of two requested nord lp’s, l.s.d. features rough hewn sheets of ominous yet trippy pulsating textural electronics with an obvious debt to the stark teutonic soundworlds of kluster and (especially) seesselberg. any glimmers of transcendence are immediately offset by a deadzone ambience that reeks of maurizio bianchi. hiroshi oikawa’s solo explorations of the galactic void seem considerably more enticing to these set of ears than the more formalized quotidian post-industrial con-structs he was fabricating under the nord moniker with satoshi katayama on their pinakotheca label debut lp from three years earlier. if this is cos-mic, than it’s the cosmos as viewed from the vantage point of a burned out cinder drifting into entropy. gripping stuff!“ limited repress from germany. – “The collected recordings of india’s best-known psychedelic rock ensemble, and the story behind their genesis, which lasted from 1973-1977. the atomic forest stand as the only indian psychedelic/hard rock band that managed to record an album: obsession ’77. the album’s mix of blistering, fuzzy rock and synth-lead funk inspired collectors the world over to fork over thousands of dollars for original copies of this — until recently — unknown platter. ” 44-page booklet of photos, liner notes, etc. – part three in this 4-part set. this 12″ slots into the elemental quad-gatefold which came with parts 1 & 2. the 2cd album elemental features a different tracklisting with alternate versions of some of these vinyl tracks plus extra content. pressed on colored vinyl and limited to 1,000 copies for the world. – fire! are developing at a rapid speed and their exhilarating gig at oslo jazz festival in august 2011 simply left the audience gobsmacked. this 10″ ep however, contains more music from their fruitful collaboration with jim o’rourke in tokyo in september 2010. here are two workouts showing the wide musical spectrum they cover. vinyl-only. – classic double live album from this free-spirited international trio, this time expanded with american sax player mars williams. recorded live at oslo’s café mono and at the nattjazz festival in bergen, both in may 2011. the interplay is simply stunning and the sound is of studio quality. vinyl-only release, limited to 500 numbered copies. – kompakt’s beloved annual institution for unreleased and praised new selections from the world of beat-less electronic music. features brand new music from wolfgang voigt (aka gas), triola (aka jörg burger), marsen jules, superpitcher, bvdub, and the new alter-ego from the field under loops of your heart.